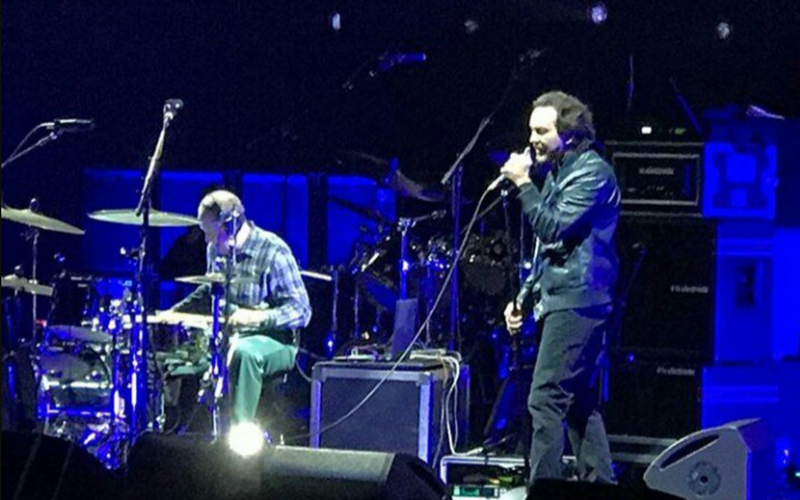 Eddie Vedder reunited with former Pearl Jam drummer Jack Irons to perform the Pink Floyd classic, “Shine On You Crazy Diamond”, at the Key Arena in Seattle, WA on March 17 and video from the show has surfaced online. Irons’ connections with Pearl Jam date back to their earliest days: after declining an invitation to join the pre-PJ band Mookie Blaylock in 1990, he passed on the group’s demo to Vedder, who added his own lyrics and vocals before returning it and eventually joining the lineup a week later. Irons went on to become the fourth drummer in Pearl Jam’s history when he joined them for a 1994 tour before going on to record 1996’s “No Code” and 1998’s “Yield” with the band. The Vedder-Irons reunion comes a week after Pearl Jam invited all of their former drummers to their Rock And Roll Hall Of Fame induction in New York next month, despite the fact that three of them will not be officially honored at the event. Set to be inducted at New York’s Barclays Center on April 7 are the current Pearl Jam lineup of Vedder, Mike McCready, Stone Gossard, Jeff Ament and Matt Cameron alongside founding member Dave Krusen, while the Rock Hall failed to acknowledge the work of drummers Dave Abbruzzese, Matt Chamberlain and Irons. Neil Young will induct Pearl Jam as part of the Class of 2017 alongside fellow honorees Journey, the Electric Light Orchestra, Yes, Joan Baez and Tupac Shakur.